Just a little question: why make this course about a Language that is used less and less after any day? Bob, I recollect similar videos before on C9. Are there the revised ones using Visual Studio 2013? as much as i remember, previous courses were about phone and metro apps. this appears to be the first VB/C# courses here. question is: are there some links to demo projet (VB/C#)? in some part of C# series i saw that there was mentioned to download demo projects and there was some project folder Lesson23 ... but i dont see/find project links. @BobTabor:Great advice, and great course. Thank you very much Bob. I think VB.Net is a great tool for common people to learn how to program and make their own apps. All other languages seems pretty much with a machine-logic and look. VB.Net is the only one that resembles the human language and logic, at least this is my point of view. I believe is easier to learn Visual Basic.Net to Little kids tan C#, C++, Java or PHP (with all my respects), this is the real power and soul of VB.Net is more human in syntax. @BobTabor: You're saying that it's best to learn C# especially in regards to Windows Phone development and so on? Is there a code.zip available for this version of C9 VB for absolute beginners? Last one was very handy. @FlyOverGirl: There definitely is. This put (hid) it somewhere on Microsoft Virtual Academy. I know it's there. I've been told it's there. I can't find it. I've tried for months to get this fixed. I don't work inside of Microsoft so there's only so much I can do except write comments like this in hopes someone sees it and takes action. Sorry! I *truly* wish I had a better answer for you. Expand the first lesson. The source code zip link is in there. I did a lot of work in the past year with your videos for C# when I was attempting to crash course the entire concept in a "learn to code" environment... it did not turn out well. I've been teetering around VBasic because I've heard there are great scripting opportunities to learn, and to advance a career, for a fledgling network admin. So I wanted to ask you, from the basic cmd shell... should I focus all of my attention on PS? Linux? Or should I add in a little VBasic as well? @NetworkAdminGavin: Hey Gavin, I believe that if you take small enough bites and you really chew on something until you can easily swallow it, you can eat the elephant (as the old saying goes). Tell me ... where did you get stuck with C#? @BobTabor:Thanks for the quick reply. Where I failed in C# was my imagination and ability to draw up projects. The company we were working for absolutely failed in producing any of the promised contracts for their academy, and we were regulated to a "benched" status for the rest of my duration with the company. My experience has always been with small business and quick and easy GUI usage, so when I was released into the world, I didn't have the slightest idea of where to start on building a portfolio to show potential employers that I was capable of coding and worth hiring. But my goals are primarily to leave small business positions and break into Enterprise level work. However to do this, I understand that I need to be able to build applications, batch administrative tasks, and so forth. My real interests lie in Hyper-V and VPN administration, primarily because I believe there is so much untapped potential. I would say my next level of interest goes into Sharepoint development. From there I would say I want to focus on creating business critical apps that would shine in enterprise level situations. I love what your doing. You are very thorough and make it easy to understand. Thank you! @BobTabor: Sorry Bob, but I have to disagree. VB.Net is no doubt used by the majority of hobbyists, but it does not mean that it is a "hobbyist-only" language. I have used it extensively (in fact, exclusively) for huge Enterprise Level projects with no shortage of features or power. Going along the same lines, the C++ language is used by everyone from hobbyists to engineers for controlling huge cyber-physical systems. Can anyone call C++ a hobbyist language?? I must say, that the VB.Net does not get its fair share of credit and it is because of false impressions created around it. That said, a fantastic course whatsoever!!! @nsnavare: I think the point I am laboring to make is this ... VB gets compiled down to the same IL as C# and other managed languages. In that regard, it is no different from C#. However, there's a different culture around C# than VB. This speaks to the quality of reference materials available. For example, look on the https://www.asp.net website ... there are no VB examples. On Microsoft Virtual Academy -- most topics are only covered in C#. At TechEd or Build conferences, I can't remember seeing a speaker use VB to demo a given feature. Most books only have source code examples for C# for a given topic. Most StackExchange answers are provided in C#. So, again, I'm not disparaging the language. It is sufficient to handle virtually any task that C# can handle because they use the same tools. The true difference is in the experience as a result of the Microsoft development community at large. Hope that makes sense. Just to be clear, VB *is* different from C++ because you can create either managed or unmanaged C++ applications. C# is unquestionably the more popular choice, and is probably a more "scientific" language, so go there for a career in application programming. However if your objectives are rapid, accurate results, then VB is the better choice. My present programming activities are mostly for fun and getting quick results. VB helps me to get VBA stuff working for elementary automation of the MSOffice products. I have an unofficial rule that anything I do in MSOffice more than 3 times in a week gets "automated" (macro recording is marvelous!!). I wonder if other senior gentlemen have similar ideas. An example of a "fun" application I wrote (in VB5) is a file renaming app. I use "VeeDub64" to create movies from time lapse photographs. VeeDub requires all the photos to be strictly sequential with no gaps. After deleting those pictures I don't want, I run the renaming app to get them all sequential, then run VeeDub. If this is the right place, I can upload the app and the source code for anyone interested (free of any charge or restriction). 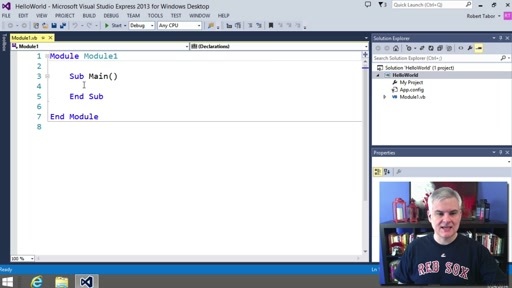 Maybe someone could do a tut about converting VB5 to VS2013?? Bob - Just a thank you for covering topics not normally covered - especially what classes and methods are, working in the VS IDE, etc. I found these very helpful and the methodical way you presented the information made it very easy to understand. @BObTabor I would be grateful if you can please answer my questions. I am a complete newbie to programming, i am not looking into a career in programming but like to be able to make small things on my own. Having had a look at other programming languages, i dont see a graphical user interface ( my knowledge is limited on programming), i want to know if i go through your 26 lessons will i be able to make a small program where users can type or click and see results through the program. Hi Bob and thanks for the lessons..I have to say though, that this is not coming easy for me and I believe it has to do with the windows forms and objects. I learned computers on an apple 2 and a commadore vic 20..I could write simple programs in basic, so I though this would be a very natural progression for me. How wrong I have been. It seems like I would prefer to write code for the windows and forms instead of drag and drop system, and how many times I want to put a "goto" or a "poke" into the code.It seems like they took a very basic and great program called "basic" and made it a hellofa lot more complicated......But I am stubborn and I refuse to give up,,,and your teaching method is making breaking old habbitts easier..thanks for the great job. I have just completed all 26 of your lessons, and I want to thank you so much for what I have got out of these. Clearly your passion for, and knowledge of programming makes you a fantastic teacher and I thank you again for this, I almost feel that I know you! I come from a VB6 background which I learnt about 12 years ago when I retired from a career as an electrical design engineer. Just for pleasure, I now enjoy writing Windows desktop applications, particularly relating to modelling, data acquisition from external hardware and control of external hardware. This may all sound a bit grand, but I assure you is not, and I am very much a novice, for example I have only just grasped the idea of Classes and their awesome power. Anyway I realised a year or two back that VB6 had come to the end of its days, but I soldiered on not knowing how to replace it, or what new language I should learn. 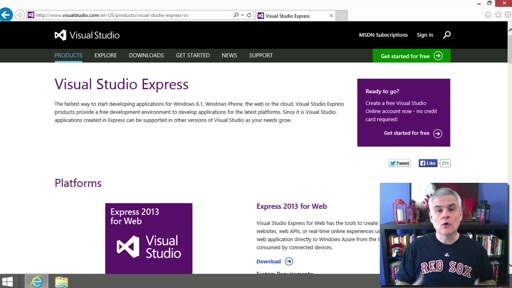 I was filled with joy when I discovered Visual Studio Express 2013 for Windows Desktop, and even more so, when I found your tutorials! So, one reason for writing was to thank you for the tutorials and it's great to have finished these in such a timely manner to wish you a wonderful Christmas and every happiness in the New Year. But I do also have two questions: I have rarely used Console.WriteLine() etc., but have always worked with Forms to provide a GUI, and I want to continue this way. Visual Studio appears to provide two options (WPF Application & Windows Forms Application) and know that you touched on this in Lesson 24. But I want to be sure to step off on the right foot; so my first question is "Which option should I use?" And then "Where on line can I find another tutorial that will take me a bit further in using and deploying this option?" @Steve Weiser: The LANGUAGE itself is very very similar to BASIC on the Commodore Vic 20 / 64. However, I'm betting what you're struggling with is the .NET Framework. What if someone had written a massive amount of code to do lots of cool stuff on the Commodore 64, like display windows, communicate via the internet, etc. That's what the .NET Framework is. It is different from Visual Basic, although VB wouldn't be able to do anything meaningful if it were not for that framework. Is it convoluted? If you need a simple solution then you may wonder why all the complexity? However, generally speaking, complexity exists to provide a larger wealth of options / freedom. It's a trade-off. Each feature exists because *someone* *somewhere* needs it. But yes, it can be very confusing / difficult to get a toe-hold. @Rodrus: WPF provides much more flexibility but with added complexity (see previous paragraph). If you're building something in-house for your own usage and you just want to get the darn thing done quickly, the Windows Forms is probably for you. If you are using this as a vehicle to learn and eventually get a job at another company and can take your time then I recommend WPF. Good luck! I have been assigned a task at work to create a simple and effecient tracking system that operator may use to track three types of equipment, the serial number, the hours of operation and the reason this equipment was taken out of service. The most simple way to arrange this I believe would be to give a menu. So beginning: Choose option 1, 2, or 3. Once chosen, they may choose whether the piece of equipment is being put into production or taken out and then give the reasoning. Can this be done and logged in excel or would there be a better option for what I am needing? Now this is what I am talking about: a prefectly, step by step web series. Where do I go on from here, I have plans of creating graphics and maybe a game, but whats the next level? For those asking WHY VB.NET. let me remind everyone that in the end it really doesn't matter. When you really learn, there is very little that can be done in C# that you can't do in VB.NET. In fact many times I will do it in VB.NET first just to prove a point. If you try to come up with a list of differences, you will find that list relatively short. So no need to ask why, just know that whatever you feel like that day you CAN get the job done 90% to 95% of the time.